People who’ve already had a heart attack or stroke can cut their odds for another one in half if they regularly take cholesterol-lowering statins. “Very few patients were optimally compliant. We found that the less compliant you were, the worse you did,” said the study’s lead author, Heidi May, an epidemiologist from Intermountain Medical Center Heart Institute in Murray, Utah. Why are so many people skipping this potentially lifesaving medication? May said the study wasn’t designed to tease out exactly why people didn’t take their medicine as they should. But she said it’s possible that patients may not understand how helpful statins can be. Not only do they lower cholesterol, they also help reduce inflammation in the body, she said. May said she doesn’t think it’s a lack of education, at least not initially. “Our institution does educate when people are discharged, but patients are given a lot of information. This study emphasizes the need for continued education to take medications as prescribed,” she said. Researchers also don’t think cost is an issue, because the medicines are now generic and relatively cheap — about $10 for a 90-day supply. But concern about side effects may be an issue for some. If that’s one of your concerns, May said you should talk with your doctor. “The good from statins far outweighs the bad. In very few people, statins may cause muscle aches, and doctors can check with a blood test whether or not statins are causing that. If they are, there are other statins you can try, or a lower dose,” she said. Researchers also suspect that some patients wrongly believe that after a few years on statins, they don’t need them anymore, or they’re just not that important. Dr. James Catanese, chief of cardiology at Northern Westchester Hospital in Mount Kisco, N.Y., said there are all sorts of reasons patients don’t take their medicines and they’re reluctant to tell their doctor when they don’t. But he emphasized that taking these drugs as prescribed is vital. “Taking statins is really going to reduce the chance of having another heart attack or stroke dramatically,” said Catanese, who wasn’t involved with the research. May’s study included nearly 5,500 people who were diagnosed with atherosclerotic cardiovascular disease. That means they had plaque buildup in their blood vessels. 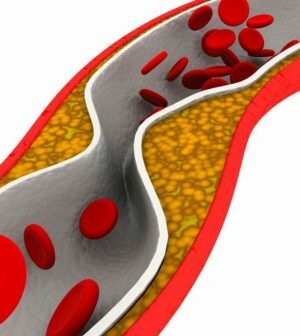 That buildup can cause a number of problems, such as heart disease, stroke and peripheral artery disease (PAD). Nearly 80 percent of study participants were male. Their average age was 57 years. When researchers looked to see who was taking a statin as prescribed, they saw that 25 percent never filled their first prescription. And 25 percent didn’t fill their second one. Just 6.4 percent took the drugs as prescribed 80 percent of the time or more. But those who took the drugs the most had a 48 percent lower risk of having another heart event or stroke. Catanese suggested developing a habit around taking your medications. “It doesn’t matter when you take a statin, so take it with other medications. Put the bottle on the breakfast table and turn it upside down when you take it. Or put an alarm on your phone. You need to form a habit around taking your drugs, because it’s not OK to only take them once in a while. It needs to be daily,” he advised. The study is scheduled to be presented March 16 at the annual American College of Cardiology meeting, in New Orleans. Findings presented at meetings are typically viewed as preliminary until they’ve been published in a peer-reviewed journal. The U.S. Food and Drug Administration offers more about using statins to lower cholesterol.